RuPaul's Drag Race is one thing, and Dragula is another — both are meritable for different reasons, and boast their own specialities (the latter, specifically scarier). But neither of those options deliberately hones in on one of the longest-standing, most-beloved drag tropes: The campy queen. Enter Camp Wannakiki, debuting this week on YouTube and featuring eight Midwestern performers whose love of bad taste makes them so, so good. 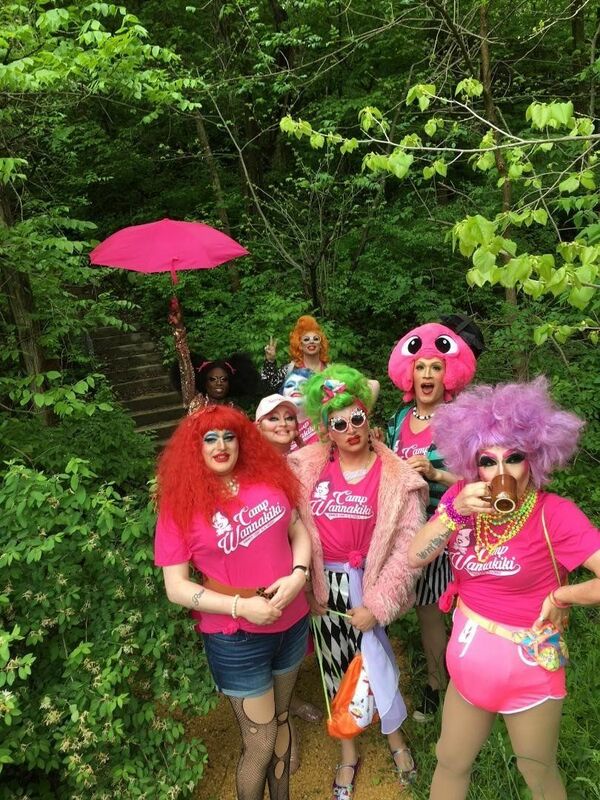 In full drag, contestants (check out the lineup here) vie for badges at a summer camp — just picturing a queen in that hot, bug-riddled environment is already a tragicomedy — through daytime competitions and a nightly talent show. The series was dreamed up by twin brothers Ashley and Brandon Wright, co-owners of the Hamburger Mary's International brand plus three of its locations — Illinois' Chicago and Oak Park, and the Wisconsin spot in Milwaukee. 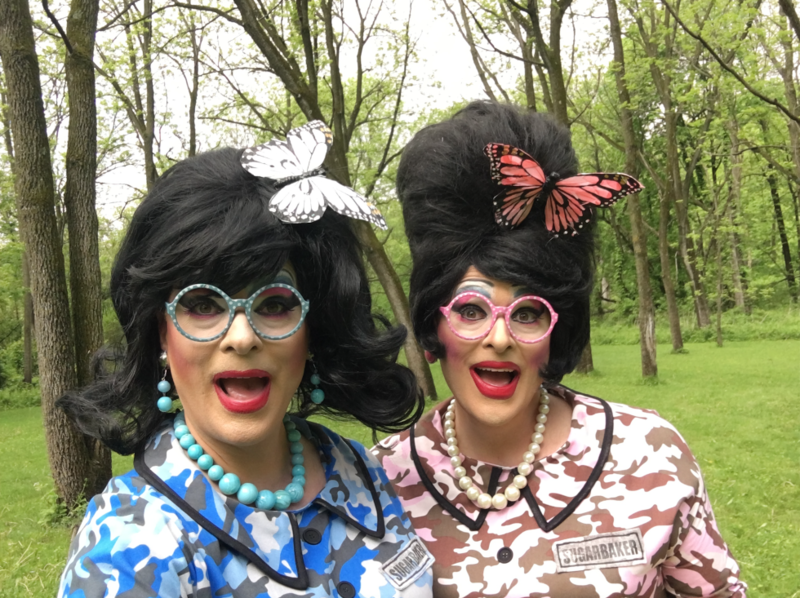 They're also Camp Directors Apple Brown Betty and Cherry Pi Sugarbaker, their enduring drag personas, who, along with Camp Director Dear Ruthie, judge the contestants, narrowing the pool one-by-one, as eliminated queens "take a hike." Camp Wannakiki is not a commercial for the iconic LGBTQ franchise, the Wrights assure. It stands alone, the first-ever reality show looking to crown the Queen of Camp — probably a reminder of why most drag performers refuse to do day drag, much less in the great outdoors. So where did the idea come from to do this? You've got so much going on already! Brandon: Archery, and all those silly things we did when we were children. Ashley: In drag, at that. So one thing led to the other and the next thing we know we're on this train that we just can't get off, and we're calling summer camps. We rented a summer camp [for a week], found eight campers, and filmed a show. Brandon: It was definitely an organic process that just came forth and the idea was so great, and it was something new that isn't really out there. Ashley: Once we started realizing what a good idea it was and what we had on our hands, we really were protective of the process and didn't let a lot of people know about it. We hand-selected the queens that were gonna be on it. It was just me and Brandon and a couple of people involved in that process because we didn't want word to get out. We thought someone who has a lot more experience in this and know-how and connections could steal this out from under us and do it before we do. So we were racing against the clock. The whole idea came about only six or eight months ago, when we first started thinking about it. "Everyone loves a campy queen, but there's nothing that really showcase that side of drag." Ashley: The main thing was the timeframe for us to rent a camp; it had to be when there aren't campers around. Summer camps normally start around June, so we had to find a place that had availability for us to rent end of May timeframe. And then you're working with Midwest weather and out in Illinois, you know, May is not always summertime. Brandon: Yeah, we had space heaters in the cabins at night. It was still chilly. In hand-picking the queens, were those performers you've worked with before or had been following? Brandon: I don't really like to use the word hand-picked because it makes it seem like it's a staged thing, which it's not. It was a competition and they went home. It was a combination of people that we did know, some of them we knew better than others and some of them we just knew by reputation. There were three people that I had never met before ever. And the others I had at least some interaction with. And some that we knew well. So it was a combination of people. Brandon: "It's not available! We're all booked up, all year!" Ashley: Yeah. So we didn't have the door slammed in our face a lot, but we definitely got the impression that a lot of them really didn't want us doing it. We were very fortunate when we found a camp in Illinois, and their motto is all about cultural diversity. It was pretty exciting when we found people who really embraced the idea of it. "We were very fortunate when we found a camp in Illinois, and their motto is all about cultural diversity." I'm unfortunately not surprised about those hurdles in finding a space. So the camp is in Illinois? Ashley: It's called Kupugani. It's about two hours outside of Chicago. It's one of the few African-American owned campgrounds, and they get counselors from around the world [and they have] multi-diverse ethnic programming in their camps. It's a cool camp, just on its own, and now it's even cooler cause they're home to a bunch of drag queens! Brandon: But they still don't have air conditioning or heaters in their cabins, though. Brandon: That was a very, very interesting process. We decided early on to keep the program a bit different than what else is out there. We decided that the campers would be in drag every day for their activities, so you see the actual drag queens doing the activities. But that presented a lot of challenges and pressures on the queens themselves, and on us, because we're not used to being in drag every day. We're getting up at 6 o'clock in the morning, or some queens even earlier than that, to get ready. Brandon: No, he says that, but we were still up by 7 a.m.
Ashley: It was early but some of the campers got up really at 5 o'clock in the morning to get ready. There were some days that we had to be in drag by breakfast, which was at 8 o'clock. And then, you know, sleeping in the bunks, in the cabins, we stayed at camp for the full week. We ate camp food, all of that. How much extra work is it being directors, being in the show, and also managing it? Ashley: It was definitely difficult at times, especially because it's our first time doing anything like this. We put on drag shows every weekend, we put on live shows all the time at our establishment, but to put on an actual TV show was something we hadn't done before. But we had a great team of people with us. The photo quality, I think people are going to be very, very impressed by that. The quality of the production was good. We have drones, that's exciting, so we get those great overhead shots of the camp, as well. Brandon: We'll definitely go with a bigger crew [next time], including a personal wardrobe and styling assistant, because that's what I think we could have used most days. Ashley: Because we were so busy focusing on the production that sometimes — I'm looking at the footage and I'm like, Oh my gosh, my hat's on backwards. But it also lends to the wackiness that you've got these two, we're the camp directors, and we're just these crazy, kooky drag queens that don't take ourselves too seriously. What's the structure of the show? Ashley: Every episode is a day at camp. There's a daily activity [like a canoe race], which would be various camp activities that normal campers would do, then every night there's a talent show. For the talent show, they had to present different looks; there's a different theme for each day. Brandon: Each day the campers are pursuing a camp badge. So the daily activity and the talent show both coincide with a badge. Ashley: Either you win a badge or you get eliminated. Every day, if there's eight campers, there's only seven badges, so one person has to go home. Brandon: They have to take a hike! "Every day, if there's eight campers, there's only seven badges, so one person has to go home." How do you decide who earns a badge? Ashley: It's judged. My character, Apple Brown Betty, and Brandon is Cherry Pi, and we have a third judge, Dear Ruthie, who is an awesome performer of ours up in Milwaukee. She's such a funny drag queen, she's worked with us for years. But she's also an actor, a comedian, and she can host anything. She's on the show as camp counselor Ruthie, and the three of us judge the talent show. I don't want to give too much away, but basically, amongst the three of us, we decide who stays and who goes, taking into account the daily activity and the talent show. Did either of you go to camp as kids? Brandon: We did. We didn't go every year, but there was one instance in camp, we were young but my main memory is that there was a scorpion and I was scared. And I got poison ivy really bad. So this camp experience was much, much better than my childhood camp experience. Ashley: The only thing I remember about that camp experience is Brandon being scared and there being a scorpion in his bed. Brandon: [Laughs] So most of our experiences are memories revolving around that damn scorpion. And poison ivy. I noticed also the emphasis on "fun and friendship" rather than "drama and backstabbing." Ashley: That was important for us from the start, because on TV, and it's not just in the drag shows, it's in all the reality shows, there's an emphasis on the drama, and the bitchiness of people, and a lot of times it brings out the worst in people. But we wanted to focus on the campy queen, and the humorous part of it, and when you go to camp, there's no drama at camp. Camp is fun. Now, we didn't shy away from it, and if there is any drama we certainly wouldn't have shied away from it. I'm not going to tell you if there was or not. But the focus of the show really was about having fun at camp and really showcasing the positive. Brandon: There's definitely no manufactured drama, that's for sure. Ashley: Yeah. Because I Feel sometimes also some of the drama feels very forced, like this isn't really [real], you know? Do they think I'm dumb? It can be pretty obvious sometimes. Ashley: That was a reference a lot of campers made as well, that they didn't want to make anything that was going to be seen as overly dramatic. I like that it might focus on more wholesome emotions. Ashley: I think there's a demand for that. If you look at the popularity of shows like the Great British Baking Show, I know it's not number one on TV or anything, but there's a lot of people who like to watch that over some of the cutthroat cooking shows. Because there's still a demand for good quality, wholesome entertainment. After the premiere, how will episodes air? Weekly? Ashley: They're going to be released on Tuesday every week with the exception of the Tuesday after Labor Day. We're not going to release one that week, so that'll be a week skipped for that. And that was, this is a side note, that was to help out with production. Brandon: So there's seven episodes — well, there are six episodes that we've filmed, then we're going to film a recorded live finale show, and that is tentatively scheduled for September 16 at the Chicago Hamburger Mary's, and we'll have the top three there to do a finale in front of a live recorded audience. You can watch Camp Wannakiki episodes as they air on YouTube here.